You've probably taken some pictures of yourself at some point or another, but none of them were on Mars. Yesterday, everybody's favorite currently-active Mars rover, Curiosity, sent back a self-shot that is literally out of this world. 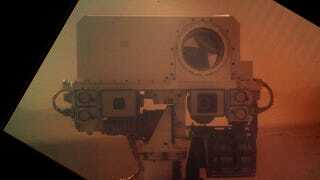 In the picture, we finally get a great shot of Curiosity's face (well, its mast) including its lone eye, which is actually the rover's rock-busting laser. It's a nice snapshot, but it didn't come straight from Curiosity in such great condition. The original picture is obscured by the camera's dust-cover, and taken from a weird upside-down angle.